If you have visited my blog of late you might have noticed a lot of scones and muffins recipes posted. As I have mentioned in some of my other posts our daughter Krista moved to Chicago in August. She has always loved scones and always enjoyed eating them while she lived at home. So I have been making scones and muffins and sending them down to her. I know that she doesn’t have a lot of time to be cooking and baking so I like making the scones and the muffins knowing that they will freeze well for her. And they are something that she can take out of the freezer and pop into the microwave for a quick breakfast. Well the last batch of scones I made for her, my guys (my husband Mike and my son Adam) asked “When are you going to make some scones for us?” So of course I made some scones this past weekend for my guys to enjoy. 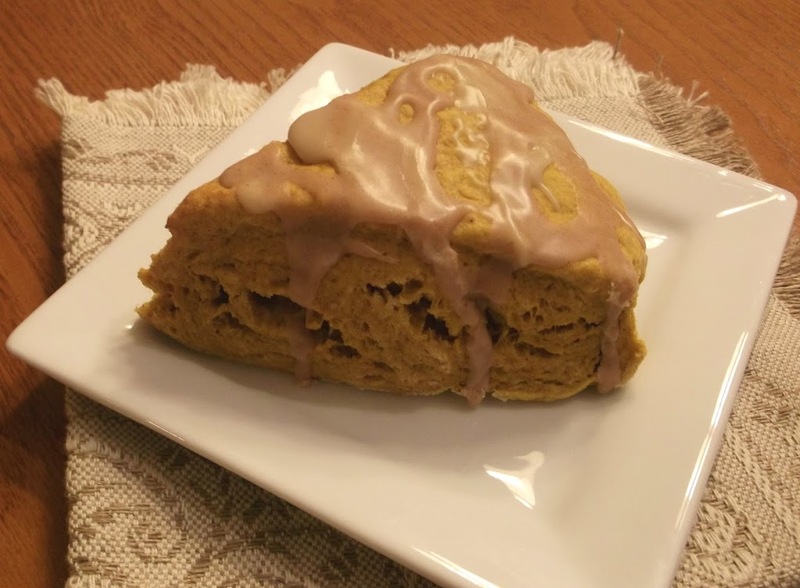 I chose these pumpkin scones mainly because I knew my guys would love them, but also it is the time of year that I love baking with pumpkin. 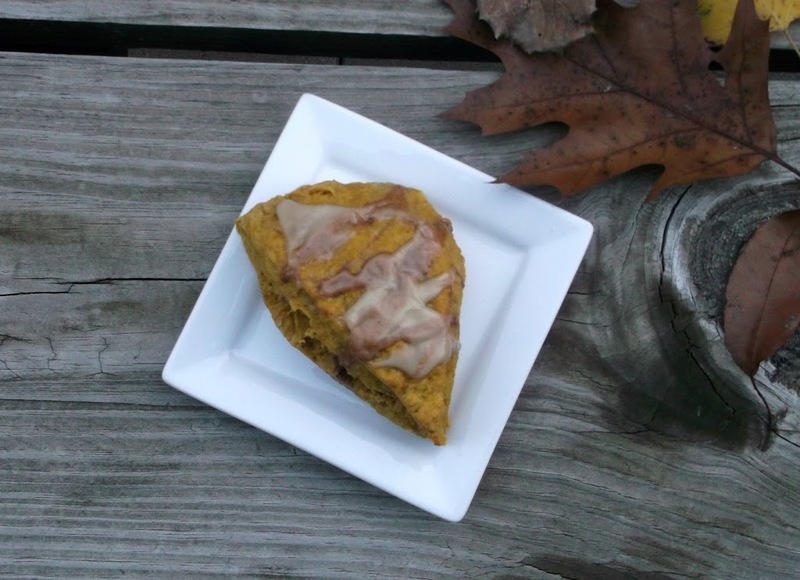 I loved how these scones filled the house with the aroma of pumpkin and spices as they baked in the oven. They turned out nice and moist. But they had a little different texture than most of the scones that I have made in the past; maybe more of a muffin type texture. This makes a big batch, 16 scones to be precise. So there were some extras to freeze and also I brought a couple out to my mom for her to enjoy also. So now I think I have made everyone happy and all is good. In a large bowl, combine the first seven ingredients. Cut in butter until mixture resembles coarse crumbs. In another bowl, whisk the eggs, pumpkin, and 1/2 cup of milk. Stir into dry ingredients just until moistened. Turned onto a floured surface; knead 10 times. Divide dough in half. Pat each portion into an 8 inch circle; cut each into eight wedges. Separate wedges and place 1 inch apart on ungreased baking sheet. Bake at 400 Degrees for 12 to 15 minutes or until golden brown. Remove to wire racks; cool for 10 minutes. Add brown sugar, cream, and butter to a small saucepan, cook over medium heat. Bring to a boil and cook a minute or two stirring constantly. Remove from heat let cool a couple of minutes and stir in enough confectioners’ sugar to make a glaze. Drizzle over cooled scones. In a small bowl combine confectioners’ sugar, milk, and spices. Stir until ingredients are blended. Drizzle over the caramel glaze. Baker’s note: I did not have the pumpkin pie spice, so I looked online for a substitute and this is what I found and used: for one teaspoon of pumpkin pie spice use 1/2 teaspoon cinnamon, 1/4 teaspoon ground ginger, 1/4 teaspoon ground nutmeg, 1/8 teaspoon ground cloves. I would love these. Not only is the pumpkin and spice smell throughout the house a beloved indication of fall, but I’ve never had a pumpkin scone before and love trying new things. Can’t wait. I’m loving all your scones and muffins – may I be part of your family, too? 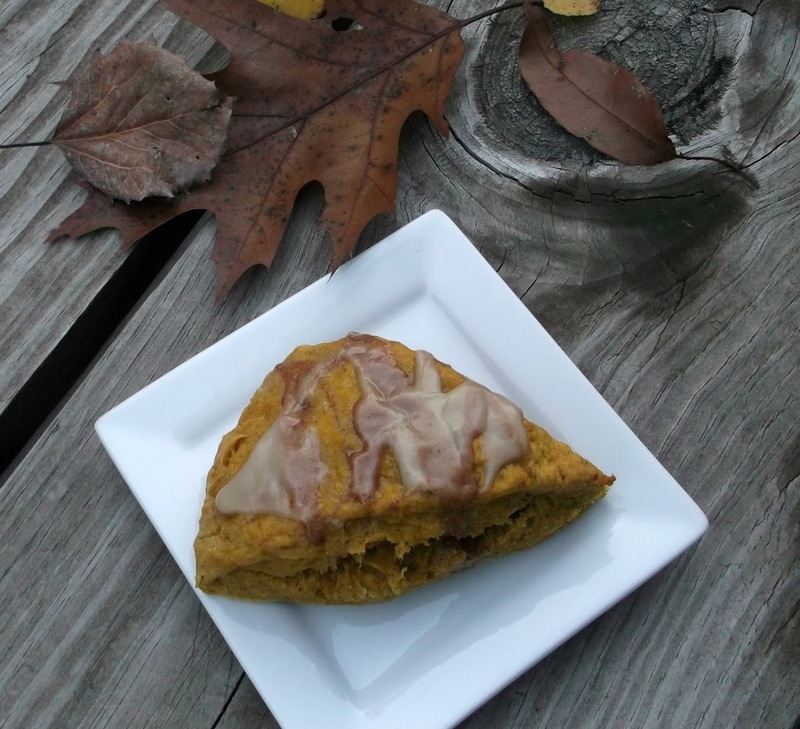 😉 Love this one – I’ve never had a pumpkin scone, and really like the idea. Such good stuff – thanks. I love pumpkin anything! These scones look wonderful.